There are far more males than females who use this site, which has meant that there hasn’t been enough data to make decent comparative statistics charts for females. Now there is, so now there is a second set of charts for females that can be found under Athlete > Statistics. The power curve chart for females looks particularly rough because of the lower number of people it’s based on. It’s similar to what the chart for males looked like when it was first added, but it will improve over time. The top group shown on the chart is the 90–95% bracket, leaving the top 5% not shown on the chart. There is now a new top segment on the chart for males, which shows the 98th percentile, leaving only the top 1% not shown. Quite a few improvements have been made to Flexicharts. The most obvious one is that there’s a “chart creator” button, which, when clicked, shows a simple interface that allows custom charts to be created with a few mouse clicks and no typing. This chart creator isn’t able to create a lot of charts that can be entered directly as commands, but it makes it possible to build some charts with a quick and simple interface. There are a lot more changes to Flexicharts beyond the chart creator. 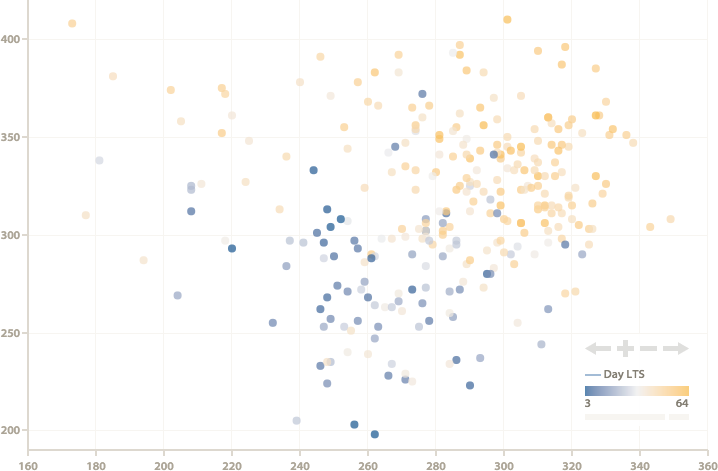 The colour of points can be based on data by specifying color as an axis. Here’s a long overdue update to the site. The major new feature is segment tracking with automatic interval detection. Segments are parts of a ride. They are given a name, and all segments of the same name can be compared against each other. The main use of segments at the moment is tracking intervals over time, as it provides a very easy way to see, for example, how all of those twenty minute intervals are going. Segments can be created on ride pages, using the tools there to find and save segments. 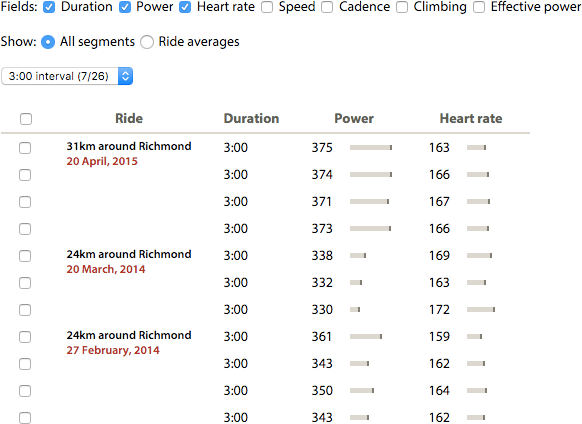 Alternatively, segments can be created automatically for intervals recorded with a power meter. To do this, you first need to set it up by specifying what duration intervals you do and a couple of other things so that the site knows what to look for. Intervals are then searched for in all existing rides, and all rides uploaded in the future. Trend lines can be shown on the “power vs. L/R…” chart, which shows L/R power balance and other advanced power metrics. 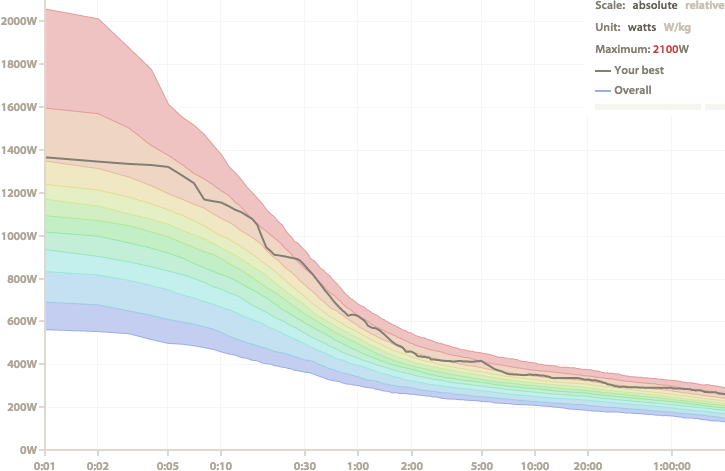 Trend lines can be created on Flexicharts using the .trendline() function. This uses the Loess method for estimating the trend. Duplicate rides can be uploaded. 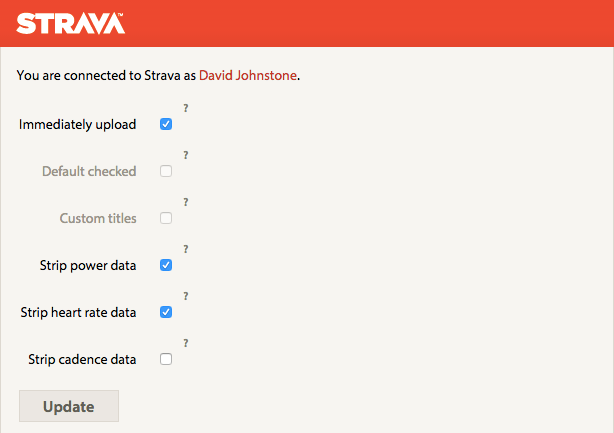 If you don’t want to share your power data with the world, it’s now possible to have the power data of your rides stripped from the ride files that are uploaded to Strava. There are also options to remove heart rate and cadence data. These new options can be found on the linked accounts page. This works by creating a new TCX file based on the ride file was uploaded and uploading that to Strava. If none of the data stripping options are enabled and your ride is a FIT, TCX or GPX file, then the original ride file is uploaded to Strava. If your ride is one of the other file formats that Cycling Analytics supports, a converted TCX file will be uploaded. TCX files don’t support temperature data, so that is lost in the process. On the topic on importing and exporting rides, a number of people have asked about automatic importing from Garmin Connect. This isn’t yet supported, and the main issue is that Garmin charges US$5000 to access this. When this doesn’t seem like so much money, I imagine that this will be added to the site. In one sentence: Two new Flexicharts commands, coaching UI improvements, some more calendar options for showing day names and week numbers and changing the first day of the week, and Pioneer ride files are now supported. There are two new commands for Flexicharts. rebase_dates allows the dates to be shifted so that multiple data sets can be shown on top of each other on the same chart, which means it’s possible to compare the long-term stress of multiple years on one chart (as shown below). accumulate causes the chart to show cumulative data, so you can see how distance accumulates throughout the year. There are a couple of examples of this in the default Flexicharts library. rebase_dates works by giving it a date, and then it shifts the x-values (when dates) so that the date provided is day 0, the next day is day 1, and so on. The Flexicharts documentation has been updated with more details and examples of the new commands. 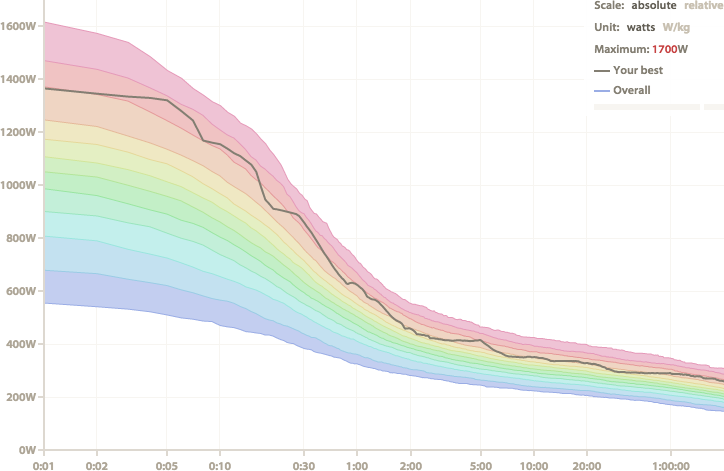 The colourful chart that shows how your power curve compares with all other Cycling Analytics users has always had a problem with faulty power readings skewing the data high, especially for short time periods. This issue has now been fixed with the help of some smarter filtering algorithms. Here’s what it looked like before today’s update. 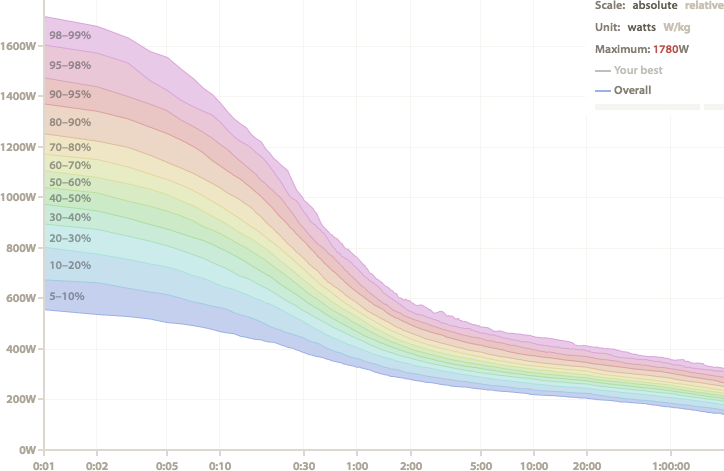 It turns out that 5% of Cycling Analytics users don’t have a maximum power output of over 2000W. All commands now start with chart() instead of rides. Flexicharts can now be saved so that you don’t have to continuously retype the same commands. Multiple commands can be given at once (separate with semi-colons). 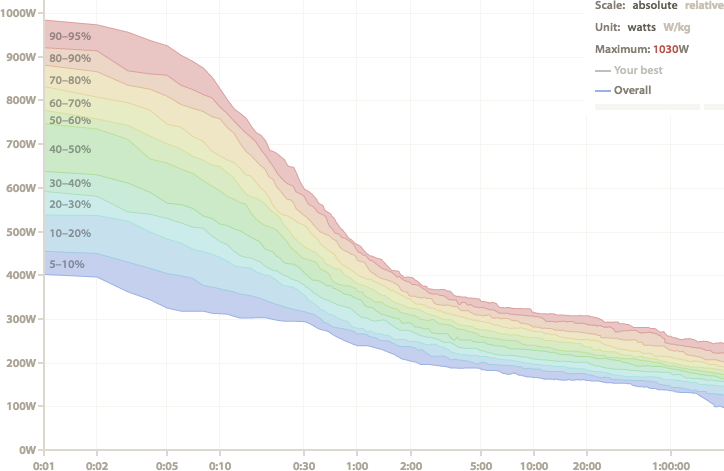 Time in a power or heart rate zone can be used in charts with power_zone(index) and hr_zone(index) functions. Commands now start with chart() instead of rides because this change was necessary to allow for multiple commands at once (which also means charts saved in the library can contain multiple commands for multiple charts). There have been some big under-the-hood changes, but everything else should work the same as they used to. As an aside, it’s been interesting to see the response to Flexicharts. For some, it provides a powerful interface to their cycling data, but to others, it’s opaque and unfriendly. Command line interfaces aren’t popular in general, and I understand why, but I think it’s overall useful that this functionality exists. It’s been a while, but some new features have landed today. First up, manual ride entry, which means you can create rides without having recorded them with a bike computer. To create a ride, click on the day you want to create the ride for on the calendar, and then click “add manual ride” and fill in as much of the form as you want. These rides can be linked to a training plan. If a duration and training load or intensity is provided, intensity or training load (if not provided) and effective power is automatically calculated because they’re all mathematically related. It’s been a bit quiet around here recently, mostly because I had some surgery a few months ago and was busy recovering from that. There’s still a long list of features to add and things to do with this site, and it shouldn’t be long before some noteworthy changes happen. Also, the Best Bike Split tool has been removed as their API has just been shut down. Hopefully it will return in the future. According to a recent survey, segments were one of the most anticipated upcoming features. Segments now exist as a way to gain deeper insight into a particular ride, and they will be used in the near future as a way to track performance over time. As a concept, segments are very simple. They are just parts of a ride, and are listed under the list of laps. 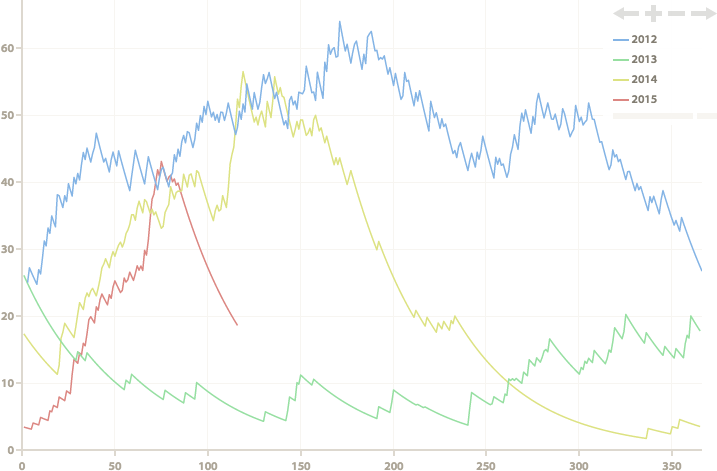 Find intervals — Given an interval duration and the number of intervals to find, this uses power data to find segments with the highest average power in the ride. This will be more useful in the future, when there are ways to compare segments over time. Find efforts — Given a minimum duration and average power, this finds all segments that are at least as long and with an average power at least as high. At the moment, this finds the longest segments possible, while still remaining above the average power threshold. Find climbs — Finds all climbs given a height and minimum gradient. The minimum gradient is used to determine when the climb should start and finish, so it’s normally best to have it as a low number (the default is 2%).